Some 100 years ago, the healthiest fatty acids were a constant component of our diet. It was full of beef, among other things. Unfortunately, since the cows began to feed with special feed instead of just grass, almost no omega-3 in their meat. What’s worse, nowadays the everyday menu of most of us contains too much of the other fats so-called omega-6 (found in some vegetable oils, eg corn, soy and fried or baked dishes.) We used almost the same amount of omega-6 fatty acids , omega-3, today – the first ones about 17 times more.The imbalance between the two fatty acids interferes with metabolism at the cell level, which can lead to cardiac arrhythmias, depression, faster growth of cancer cells and the development of autoimmune and inflammatory diseases. Scientists say that by enriching the diet with omega-3 acids that protect our arteries, there will be much less cardiovascular disease, heart attacks. It has long been believed that these compounds can help relieve the symptoms associated with depression, ensure better and longer brain function and prevent cancer. Recent studies in Finland and the US have shown that in people with high levels of two types of omega-3 (EPA and DHA) in the blood, the risk of dying from a heart attack is 50-65 percent lower than people who lack these acids. 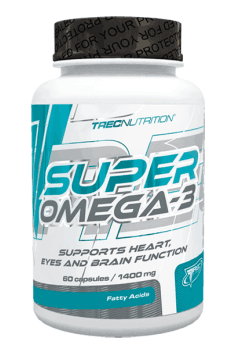 Omega-3 provide the correct heart rhythm. They prevent sudden, irregular heart muscle contractions, which in the case of a heart attack are a direct threat to life. Research carried out in the Netherlands with 400 people confirmed that omega-3s protect against depression. They probably increase the sensitivity of brain cell membrane receptors to serotonin – a substance that improves mood. It was also found that these acids have a beneficial effect on the brain. In Norway, cod liver oil, rich in omega-3 fatty acids, was given to pregnant women and in the first months of breastfeeding. It turned out that later their children obtained higher results in intelligence tests compared to their peers. French scientists, on the other hand, have found that people over 63 who consume a lot of omega-3 fatty acids are 40 percent less likely to lower their mental performance. Laboratory tests have shown that omega-3 inhibits the growth of cancer cells. There are also many indications that women who eat a lot of these fatty acids are less likely to suffer from breast, colon and uterine cancer. Probably omega-3 can also alleviate ailments of asthma and rheumatoid arthritis. Our body does not produce these acids. They must be delivered in food. The real treasure is greasy fish from cold waters, salmon, tuna, sardines and mackerel. Just eat them twice a week. They are full of walnuts, linseed, rapeseed oil. Do not you like fish? You can take 1 g of omega-3 per day in the form of supplements, eg Bio-Omega-3 Plus, Omega-3 (salmon oil in capsules).